Justice Minister participates in Gerrer hassidic wedding, in a display of closeness between Shaked and Gerrer MK Yaakov Litzman. Justice Minister Ayelet Shaked participated this week in the wedding of a grandson of the Gerrer Rebbe. At the wedding, she also met the Gerrer Rebbe's wife. This is the first time that Shaked has participated in a wedding of a descendant of the Gerrer dynasty. 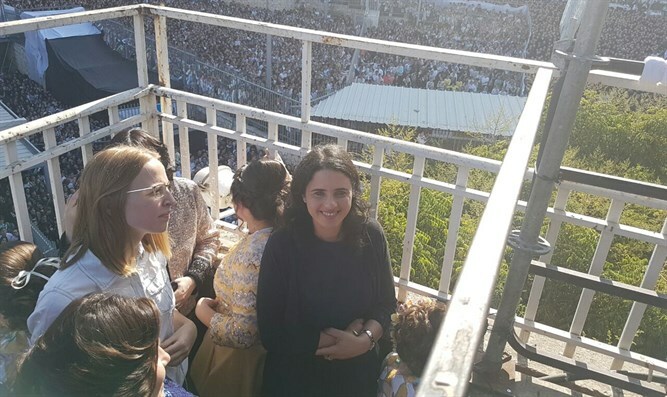 Her participation shows the level of closeness between Shaked and the Gerrer community's representative in the Knesset, Health Minister Yaakov Litzman. During the wedding, the Gerrer community displayed a high level of openness, welcoming Shaked with a smile and open arms. Litzman took the initiative, telling Shaked, "You have to come!" "I was happy to participate in the wedding," said Shaked. "There is no doubt that we are talking about an impressive event, and that the fact that I was invited to participate shows how close the Bayit Yehudi faction is with the hareidi community. But this not so important. What is more important is how joyful the wedding was. I wish the couple, as well as the Gerrer Rebbe, his wife, and the entire hassidic community a hearty mazel tov."